A revocable living trust is a legal document signed by the trust maker and trustee. It lists the property assigned to the trust, the trustee, and the name of the beneficiaries of the property held by the trust after the trustee dies. The trustee exercises control over the property and so it often is the same as the trust maker until their incapacity or death. Our Highlands Ranch revocable living trust attorney can assist you with several aspects of estate planning, including your revocable living trust. We recommend estate planning for anyone with minor children who want to ensure that the children have trustworthy guardians after their death and for clients with complex estates who want to avoid probate or lingering disputes among potential heirs. Many parents may assume they know who will take care of their minor children if both should be deceased. Our Highlands Ranch revocable living trust attorney can address just about any issue you might face at incapacity or death. The general rule is that larger estates and those with young children are better off with a revocable living trust than with a will. The appointed trustee of the trust can immediately take charge, distributing assets as needed and that even can happen before the trustee’s death if they are ill or incapacitated depending on how the trust is set up. All assets funded to a trust avoid probate. Probate can take months or even years if the will is disputed, delaying the distribution of property, which is a major problem when children are involved. The trustee of a revocable living trust and the named guardian can quickly use trust assets to provide for the children as instructed. If a person holds property, in more than one state, the property will have to go through probate in each state separately when it is in a will. Distributing property to beneficiaries through a trust will avoid probate and save money. Unlike a will, living trusts do not generally become public after the settlor’s death. Our Highlands Ranch revocable living trust attorney can help you settle a trust. They are generally more complex than writing a will. In order to be funded, all of the property named in the document needs to be retitled and transferred into the trust. That can include transferring the beneficiary of a life insurance policy and placing the title of your home into the trust. It can be a more complex process than simply creating a will, which is one reason why we welcome our clients into our law office when working out the details. Some people confuse a revocable living trust with a will. Both allow a person to name their heirs, transfer property to their children upon their death, and can be revised as circumstances or wishes change. However, a trust will allow a person to name guardians for their minor children, managers for the property until minors come of age, instruct how the debts and taxes are paid. Even without minor children, there are significant differences. Living trusts will stay private even after a trustee’s death, whereas a will becomes a matter of public record. 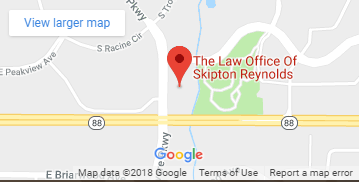 If you are interested in having a living revocable trust created for your estate near Highlands Ranch, CO, you can come into the Law Office of Skipton Reynolds and our Highlands Ranch revocable living trust attorney will be able to answer any additional questions and create a legal document that protects your dependents, property, and legacy after you pass away.